This week I finally found a spool of this stuff thanks to Greg Garcia at Charlie’s and started playing around with it. What an awesome material with tons of potential uses. 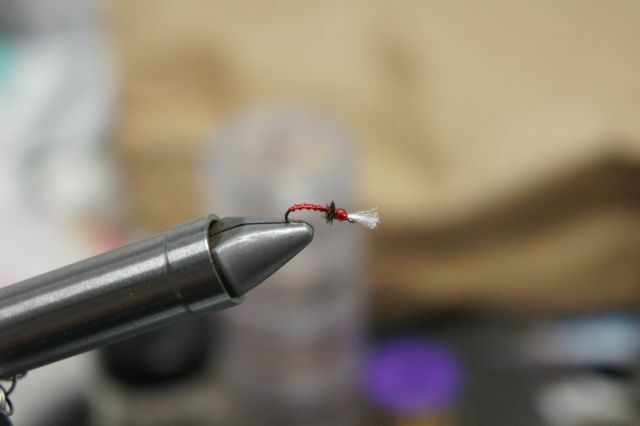 So far I have only used it on Top Secret Midges, Rojo Midges, and RS2’s but I am now looking for other ways to use the stuff because I love the way it looks. Even though they are just trout and they usually eat marshmallows and corn there is still something incredibly fun in tying flies you just think look good. If you’re interested in trying some out I know Blue Quill Anglers sells it in small packs for about $1.00 but if you live in Denver you can email me and I’ll let you know where I found the larger spools. On a side note, Greg Garcia is the nicest person in the world and always helps me try to improve my tying skills when I see him in the shop. As a special thank you I butchered his famous Rojo Midge and subsituted his Oral B floss material for Glamour Madeira on a Rojo Midge. 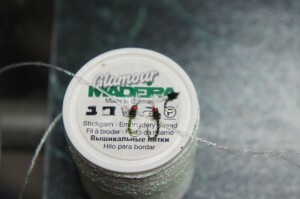 Been tying the Top Secret Midge without the Glamour Maderia but glad I found this information and live in Littleton. Will check out The Creative Needle. Enjoy! Pretty interesting material. Works really well for shucks as well. Can anyone who has one of the Glamour Madeira #2400 give me the numbers on the other side of the bobbin? It took me some time to find the supplier -which I believe was located in Denver- but I’m sorry to say I lost the contact info. Once I received the 100-meter spool I gave some to several friends and forgot to save for future purchases. But I’ll be happy to send you a length of it if you can’t obtain it. Just forward your full name and address. More so, just a couple of days ago I did watch Davie McPhail tie a Rough Midge Pupa Buzzer in YouTube, in which he uses Madeira Metallic Thread. A quick Google search shows Walmart carries a good number of them. Found your site while looking for the Glamour Mateira thread and seen this post on your site. I may of found some here in Pennsylvania but they are calling it ” IRIS ” not ” Prism White ” Is prism white the true name. Any other info that you can give me so I can check locally. Another note some of the fishing trips you posted are really nice, great pictures and seemed like you had a great time. Good for you, and would like to try that sometime myself. Thanks for your time and tight lines this year. Thanks in advance and here is the info below…….. I would love to get so Glamour Madeira with out buying the whole set with all of the colors. Can you tell me where I can buy a spool or two? The Creative Needle here in Denver sells it. What’s with these midges?! 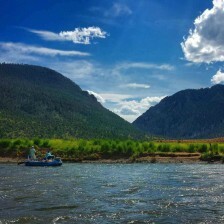 Are you commencing the First Annual Taylor’s Tailwater Tour or what? I want to see you tie a Dungeon or Cougar entirely out of Glamour Madeira. And btw: that Taylor’s Tailwater Tour thing? I just trademarked it, so don’t even think about it. 1. Midges are easy to tie and make me look good. 2. I will do that for you this week. I promise. 3. Fine. Mine is called the Terrific Taylor Tailwater Special. I’m sending out invites next week. Don’t look for yours. It’s not coming.